For years, indigenous peoples in the Amazon have been sounding the alarm about the dramatic changes they are seeing in their forests, rivers, and crops throughout their territories. Droughts when it should rain. Floods during the dry season. Extreme heat. Hail storms. Changes like these are putting their cultures, food sovereignty, access to water, and their very lives at risk, as well as the protection of a crucial rainforest that the entire world relies upon for climate stability. So far, this early warning call from those who live closest to the earth, in intimate relationship with the rhythms and cycles of nature, has gone unheeded. But scientists have finally caught up with the lived experience and traditional knowledge of indigenous peoples. As the Florida Panhandle picks up the pieces and North Carolina recovers from its second hurricane in less than a month, the Intergovernmental Panel on Climate Change (IPCC) has issued its most dire warning yet. Climate change is here. It’s not an issue for future generations. Millions are already living with the impacts of stronger hurricanes and typhoons, longer fire seasons, droughts, floods, and egregious inequality while glaciers melt, forests burn, and the White House peddles climate denial and dismantles environmental protections. If there weren’t already a scientific mandate for extinguishing the fossil fuel industry, the IPCC report provides further evidence of the inescapable reality: there must be no new exploration, no new infrastructure, and a rapid decline of existing fossil fuel production if we have any hope of maintaining an inhabitable planet. What some once considered a faraway, distant risk to future generations is actually an urgent, existential threat to humanity. In our lifetime. Scientists have determined that several of the worst projected impacts will materialize by 2040. This is not a burden for our children. It’s ours. Pardon the cliche, but it’s literally time to sink or swim. The litany of climate impacts outlined in the IPCC report aren’t new: oceans acidifying and dying, rising waters threatening to submerge small island nations and coastal communities, an increase in extreme weather events, forced displacement, drastically changing ecosystems. The findings aren’t even surprising, because we already see these impacts on the nightly news. While the overarching message is the same as past IPCC reports, last week’s publication is still more sobering. In essence, the report confirms what we’ve been saying for years: limiting temperature rise to 1.5 degrees not merely an aspiration found in the Paris Accord. It’s a necessity to ensure the survival of millions around the world. But how we get there, and how soon, is daunting, to say the least. The report is packed with key numbers and technical research. It examines “emissions reductions pathways” for a world with 1.5 degrees C versus 2.0 degrees C of climate warming and comprehensively lists the resulting impacts with varying degrees of certainty. According to the report, there is a very high degree of confidence that over 99 percent of coral reefs alive today will be dead with 2 degrees of warning; medium confidence that an additional .5 degrees C of warming will increase sea level rise by 0.1 meters, exposing up to 10 million people to “associated risks.” It underscores the reality that as the planet warms, every degree matters. Even small, incremental increases raise the likelihood of apocalyptic outcomes. Scientists conclude that carbon dioxide emissions must begin to decline well before 2030 if there’s hope of avoiding overshooting these limits without resorting to large-scale carbon capture schemes (high certainty). Clearly, scientists strained to find language to talk about the monumental changes the world might see. The report warns of “disproportionately rapid evacuation of the tropics.” Seriously? Put another way, we’re talking about the dissolution of national borders and a population of environmental refugees greater than the world has ever seen. Behind the dry syntax and cold numbers is the fate of the world as we know it. 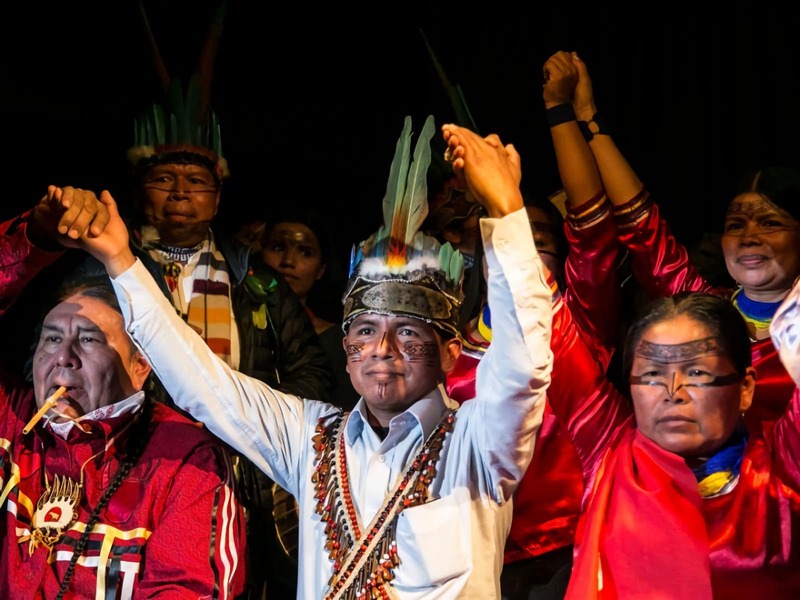 In many ways, it’s the exactly same message of urgency that indigenous and grassroots leaders have brought forward, from the UNFCCC Conference of Parties (COP) to the Global Climate Action Summit. And many of the reports’ “emissions reduction pathways” echo these community demands: we must keep fossil fuels in the ground, rapidly shift global economies toward renewable energy and stop financing fossil fuels, and ensure that this unprecedented action balances the need for rapid decarbonization with the needs of those most impacted by climate change – poor people of color and indigenous people. Making this just transition is a tall order and the coming decade will mean everything. As a recent op-ed put it: Stopping Climate Change is Hopeless. Let’s do it: It begins with how we live our lives every moment of every day. The glimmer of hope for our collective future lies in our ability to mobilize. Now. And it depends on our willingness to fight, not freeze, in this historic moment. We need to transform business as usual across all sectors of society and economy and to elect representatives who care about our health and wellbeing. If any of this is going to happen, it will be because people-powered movements will be holding politicians and businesspeople accountable for their actions and inaction. It will be because people heed the warning of this report and take seriously the knowledge and prescience of indigenous and frontline communities fighting for their survival. It will be because we refuse to let fossil fuel CEOs and corrupt politicians sell away our future. We have so many of these visionary leaders to guide us and give us hope in the face of uncertainty – we just need to listen to them. At Amazon Watch, we are inspired by the the U’wa of Colombia, who told us over two decades ago to keep the blood of Mother Earth in the ground, and by the many indigenous nationalities who have taken up this rallying cry around the world. We are encouraged by the U.S. students who sparked a global divestment movement that has shifted trillions of dollars in capital away from fossil fuels over the past six years. And we are also committed to doing our part in one small but essential piece of the fight to stop catastrophic climate change: protecting one of world’s largest rainforests by supporting indigenous rights in the Amazon. Deforestation is the second-largest driver of climate change after fossil fuels, which is why the Amazon has recently switched from serving as a vital carbon sink to a net source of carbon. We know that indigenous peoples are the best stewards of their lands, and they set an example for all of us by putting their bodies on the line to protect their territories from unwanted industrial development. We will continue to stand with them and use our international reach and campaigning to effect change on an international stage. This IPCC report does not change our work, it simply provides us with a renewed sense of urgency. As we look through this window of opportunity, this small window in which a livable world is still possible, we cannot despair and we must act. This article was originally published at Amazon Watch. It has been re-published at IC with permission.